St George property deeds are legal instruments that transfer some property right in real estate. 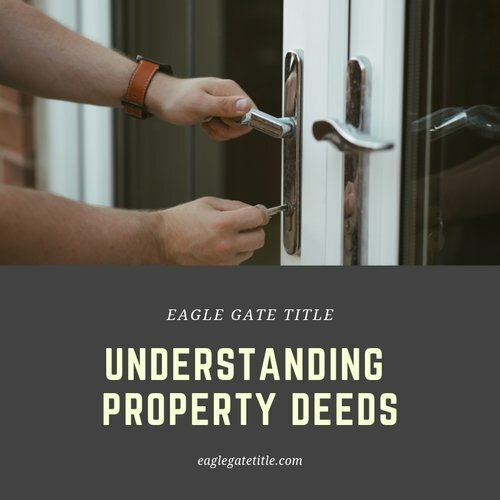 A deed contains three distinct pieces of information: a signature from the individual who is transferring property, the names of all parties involved, and a description of the property being transferred. There are different types of St George property deeds, all of which are used in specific ways in certain circumstances. These include warranty deeds, grant deeds, and quitclaim deeds. Warranty deeds supply further promises in addition to transferring ownership (including the promise of a title with no liens). The party who transferred property is responsible for compensating the buyer if promises are unable to be kept for any reason. Grant deeds, in addition to transferring ownership, assure the buyer that the property being sold has not been handed over to another person. Quitclaim deeds transfers property ownership rights from the transferring party to someone else. This is the deed type most often used when ownership rights aren’t clear. Even after describing the three main types of St George property deeds, one particular questions still comes up often. How does one purchase property jointly with another person? Joint ownership of property can be accomplished in one of three ways. The way that one chooses to go about this is very important. The three ways are tenants in common, joint tenants, and tenants by the entirety. Tenants in common allows the parties involved to obtain unequal shares if they desire. It also makes clear the person(s) to which one’s share will fall to upon death of an ownership holder. Joint tenants is the option chosen when both parties desire equal shares of ownership. If one of the ownership holders passes away, their shares fall to the co-owner. The property right in the person’s will does not need to be disposed of under a joint tenant situation. Tenants by the entirety (sometimes called community property) involves spousal property in that both people have full ownership of the entire property and neither can transfer any ownership rights anywhere whatsoever without the other’s consent. St George property deeds need to be witnessed, filed, and notarized. Step one is the transferring party visiting a notary so that the signature can be witnessed. Step two is then visiting local county recorder where the land records department is and recording the deed with them so it’s officially filed. The transferring party will keep the original deed and the office will retain a copy. What Are Trust Deeds and Contracts For Deeds? There are two more types of St George property deeds that we haven’t mentioned yet – trust deeds and a contract for deed – because they don’t actually transfer property, but it is still important to know about them. A deed of trust (also called a trust deed) is a mortgage that transfers a property title to another person (the trustee) who holds the land as security for the loan. The title is returned to the borrower after the loan is paid off. A contract for deed is an actual contract that awards a party the property title only until the loans are paid off by the other party, at which point the original borrower receives the title back. 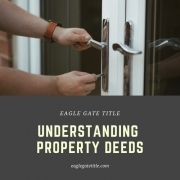 If you have more questions about property deeds, contact Eagle Gate Title and will provide you with all the information you’re looking for. Remember that the purchase of land and property usually represents the largest financial investment that a person will ever make. This shouldn’t be taken lightly. Be sure your are careful and meticulous about making certain that everything is in order when it comes to Saint George property deeds.